Shea butter and castor oil impart moisture, while essential oils add natural scent that’s much more gentle on your hair. After your scalp adjusts to the new formula, your hair will be super soft, shiny and feel all-around healthier. 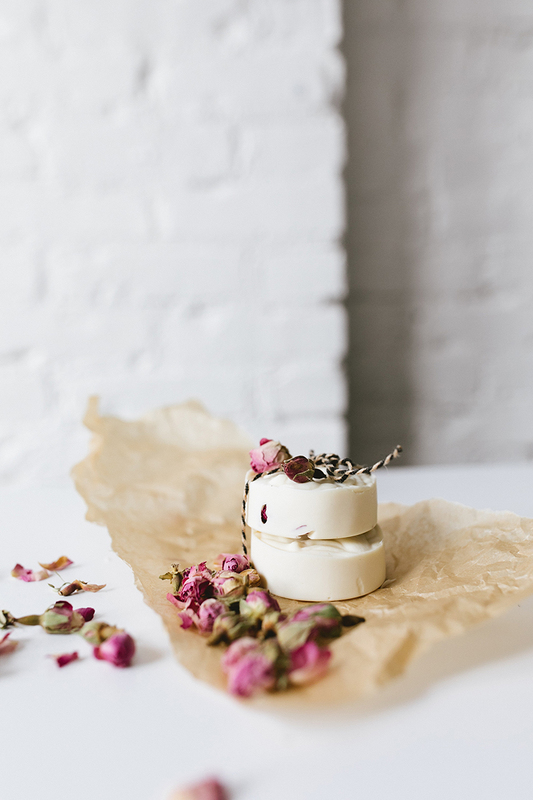 I love that I can customize the scent of my homemade shampoo bar recipe to suit my mood and the season and it’s definitely a bonus that after the initial investment in supplies, this is a much more economical option than buying shampoo (not to mention all the plastic packaging I can avoid). Start by putting on your rubber gloves and safety glasses (eyeglasses and sunglasses work, if that’s all you have). We’re going to be working with lye, which is extremely basic and will essentially affect your skin in the same way as a strong acid, so it’s best to be very, very careful when dealing with it. 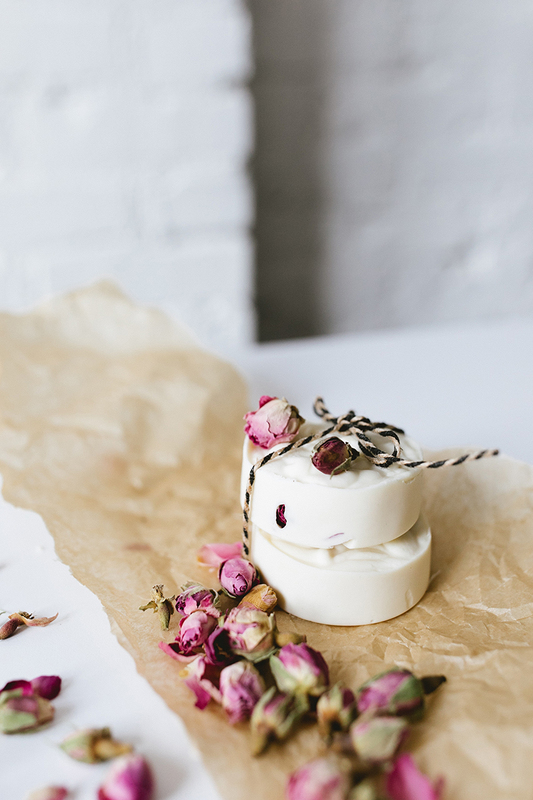 Soap making isn’t hard, but we do need to be precise and deliberate. Carefully measure the lye — again, we need to be really precise with this recipe in order to get the soap to form with the proper chemical composition — and set aside. Now, add the water to a heat-resistant vessel (a Pyrex measuring cup works great for this). Carefully pour the lye into the water and stir gently until combined. Be careful not to breathe in the fumes, and make sure you add the lye to the water, not the other way around. When stirring, you’ll notice that the water mixture will start getting very hot and may even steam. This is normal! It’s science! It’s cool! Place the lye and water mixture in its heatproof cup into an ice bath and let cool while you complete the next steps. 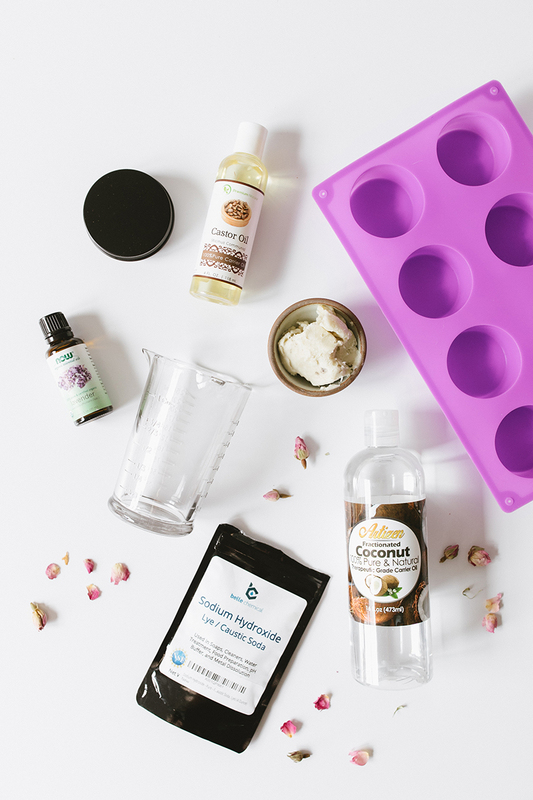 Combine your olive oil, shea butter, castor oil and coconut oil into a small pan over a double boiler. Heat on medium and stir until all the fats have dissolved and combined. Take it off the heat and let cool. Wait until both the lye mixture and the oil mixture have both cooled to about 100 degrees. The goal is to combine them when they are right around the same temperature, so use a thermometer to get an accurate idea. Make sure you have your gloves and your eye protection on again and carefully pour the lye solution into the oil mixture. Avoid any splatter by pouring the lye mixture down the wooden stir stick you’ve been using. Stir for a bit with the wooden stick, then use the immersion blender to combine. Make sure to completely submerge the blades in the mixture to keep it from splattering. Slowly move the blender around until the mixture has fully emulsified. Keep blending until the mixture is about the consistency of pudding. Once you think you’ve reached the right consistency, take the blender out of the mixture and drizzle a bit of the mixture onto itself. We’re looking for something called tracing. What that means is that the ribbon of drizzled mixture should stay visible and should not sink back into the mixture. Now, add in the essential oils and give it one last stir with your wooden skewer. Carefully pour the soap mixture into the silicone molds. Tap the silicone mold several times against the table to rid the mixture of any trapped air bubbles. 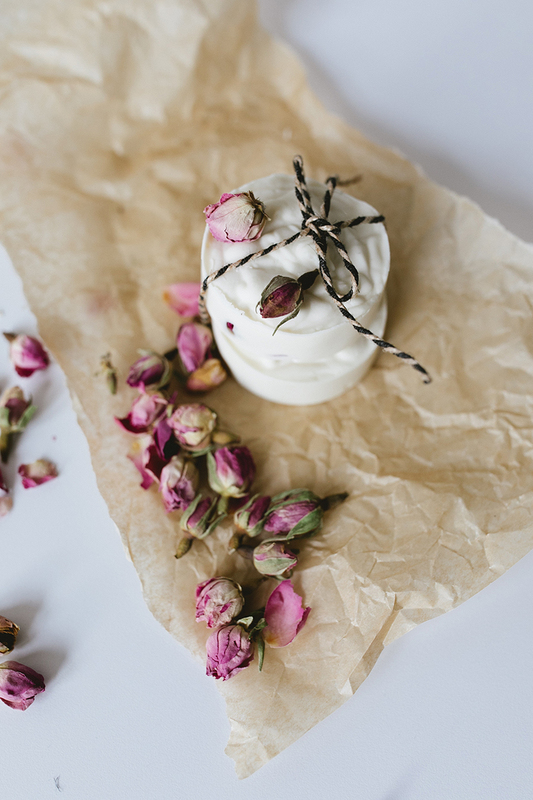 Sprinkle with dried rose petals, then wrap the whole mold tightly in plastic wrap. Cover the wrapped mold with a kitchen towel to keep the heat in and encourage the shampoo to form properly. After 24 hours, demold the shampoo bars and lay them out on a cooling rack. The final step does require some patience. 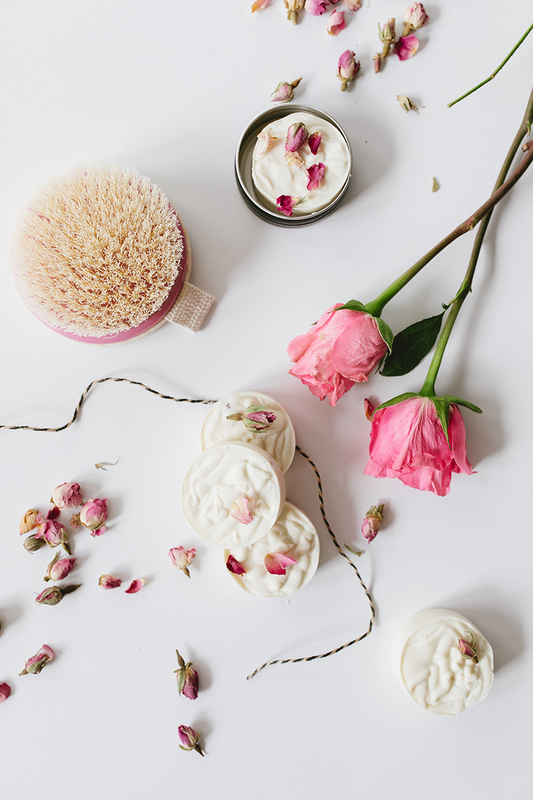 Place the rack of shampoo bars in a well-ventilated place and let it age for at least four weeks — or really any amount of time between four and six weeks. Basically, this process allows the alkaline lye to mellow and create the proper pH levels in the soap. Although lye is very caustic in its natural state, after the shampoo bars go through their ripening process, they are perfectly safe! As I mentioned above, the wonderful thing about making your own shampoo bars is that you can completely customize them. Experiment with different fats like avocado oil, sweet almond oil and cocoa butter to add different levels of moisture to your hair care. 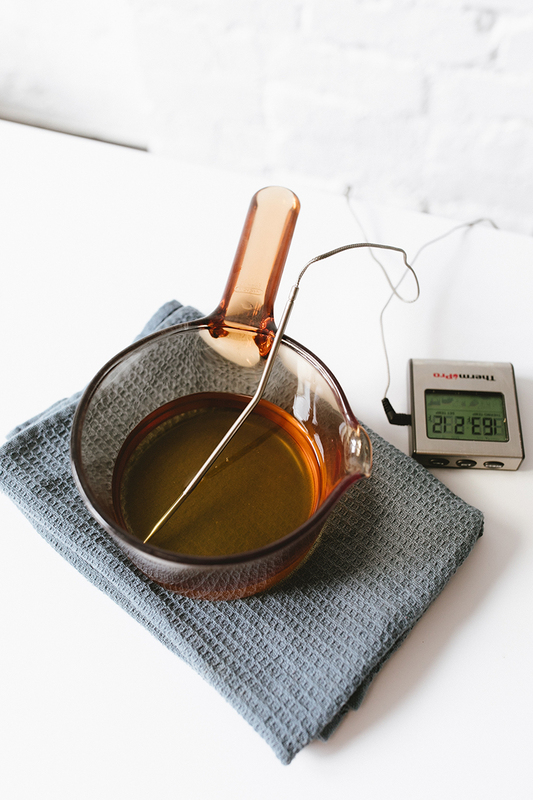 Just be sure to use a lye calculator to figure out how much lye to use for different oil proportions. You can also add things like clay for extra cleansing (great for oily hair!) or honey to help seal in moisture. There are a bunch of great hot process soap recipes out there, so don’t be afraid to mix and match. After your soap has aged properly, it can be packaged in these cute little black tins. These are great for gifting and great for traveling — which is the perfect combo as we head towards the holiday season. All you need is some pretty twine to put the finishing touch on this project.